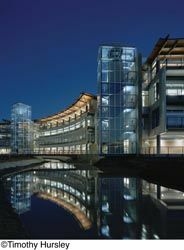 The Heifer International Headquarters was recognized by the American Institute of Architects as one of the "Top Ten Green Projects" in the U.S. in 2007 and is a LEED Platinum building. The Heifer project utilizes both motorized and manual Draper FlexShades for solar control. SPICELAND, IN-Among the features of the new Heifer International Center's headquarters are large, energy-efficient plate glass windows for passive solar heat and indirect light, and a curved shape to capture the maximum amount of sunlight. These and other sustainable construction practices eventually helped the building achieve a Platinum LEED certification from the U.S. Green Building Council. But when the facility first opened, a glaring problem emerged: Workers couldn't use their computer stations on the south side of the building due to the sun load coming through those extra large windows. Erik J. Swindle, director of facilities management for Heifer International recommended going with interior window shades. Management agreed, but only in private offices on the south side of the building. They called in Gerald Rogers (AIA), president of Little Rock's Blind Ambition, a shade dealer for Draper. After studying the building orientation, he recommended GREENGUARD-certified Draper shades with Phifer SheerWeave SW2000 fabric. "We used the LEED system and designed the openness for the HVAC loading of the building due to its orientation on the site," said Rogers. "Although the shades were added after the building was occupied, and the original LEED calculations were complete prior to the shades being added, the shades did add to the LEED certification."